I’ve already been telling you about the Christianity and Star Trek Symposium at the Transpositions blog. Now, you can read the first of my two posts in the symposium and get a sneak peek at what’s to come in our Audio Commentary Series! The topic of Spock as a Christ figure is one of my most popular subjects and I love speaking about it to churches, schools and fan events. 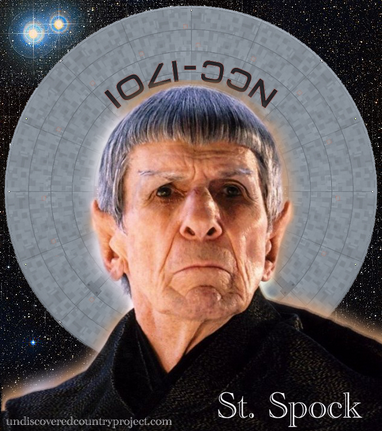 So, when I was asked to contribute to the Transpositions blog’s very cool and exciting Christianity and Star Trek Symposium, Spock and Jesus seemed a logical choice of subject matter. But I decided to have a little fun with it. Remember how I was so excited about what I found in Star Trek IV during my Star Trek Holy Week? Well, in this post, I give you a sneak peek of what I found. I’ll go into even more detail in the other big release happening today, but this post is a great window into just how detailed and amazing Spock is as a Christ figure. So, what are you waiting for? Click here or on the image above and read the post, then be sure to comment and tell me what you think! While you’re there, be sure to check out the other entries. They are all quite thought-provoking. I hope you enjoy the symposium as much as I have!